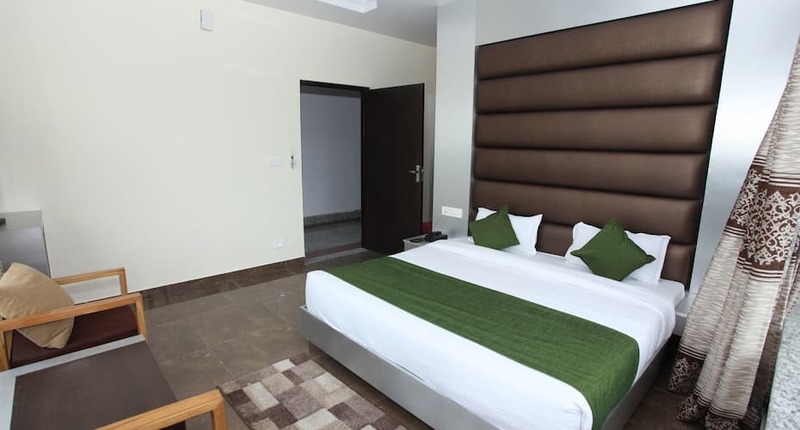 Offering free internet access and breakfast service to its patrons, Hotel Trihari is a budget accommodation in Rishikesh, placed 2 km away from the Rishikesh Railway Station. Radha Govinda Temple is a known tourist spot, located 0.5 km away from the premises. This 2-storey property comprises a total of 15 spacious rooms. In-room amenities offered are tea/coffee maker, bottled drinking water, room heater, wardrobe, and attached bathroom with hot/cold running water facility and toiletries. Hotel Trihari features a restaurant serving a range of delicacies. Additionally, conveniences such as 24-hour front desk, airport transfers (chargeable), air-conditioned public areas, round-the-clock room service, laundry, power backup facility and ironing board (on request) are also provided. Places of interest include Ganges River (1 km), Triveni Ghat (2 km) and Shri Ram Jhula (13 km). This hotel in Rishikesh is accessible via travel hubs such as Inter State Bus Terminus Rishikesh (1 km) and Jolly Grant Airport (18 km). Full refund if you cancel this booking by 23-Apr-19 12:00 PM IST. First night cost (including taxes & service charge) will be charged if you cancel this booking later than 23-Apr-19 12:00 PM IST. What needs to improve : need to add spa facility. One of the favorite hotels I staying in Rishikesh. Upon arrival time we were warmling welcome by The hotel staff the staff was extremely friendly,the restaurant very flexible .the tourist attraction nearly we enjoyed ganga arti evening . Loved staying here for 6 weeks while I stayed in Rishikesh. Quiet, clean, heater, a/c, lights always, good hot water, and comfortable beds. Add friendly helpful staff 24 hrs along with walking in a nice community by the Ganga....... I felt like home. The Restaurant was tasty and room service was good. The cost was reasonable and good transportation provided by public rickshaw for anywhere I wanted to go. Been traveling to India for 40 years and this hotel has been a wonderful addition to my favorite places to stay. As a westerner I would recommend this hotel to anyone. Enjoy! By the way I am 68 so needed the extra comfort this hotel provides. This hotel is situated in the main road itself. Its a pretty nice and decent property with a nice view from some of the rooms. the staff is very cooperative and rooms are neat and clean. The food is okay. the places of tourist interest are very near and easily accessible either by own conveyance or there are lots of share auto available once you come out of the hotel. A really nice budget option in the heart of Rishikesh. Good location near the Ganges. Beds were clean and comfortable. Bathroom was nice with ample hot water. Good free wifi. Breakfast is basic but good. Room was not very clean and there was a lot of noise In the hallways from other guests or hotel staff. No water for shower and bedsheets were smelly. Hard to communicate with hotel staff if you dont speak Hindi. Would not recommend this place. Ask them and they will guide you the best!